For many Affiliate Marketers, their affiliate business is designed to be a residual income stream. There to support them while they either engage in other endeavors or continue to build new income steams. Many successful Affiliate Marketing sites/ campaigns are able to generate a steady income without much more than occasional maintenance, it is one of the really appealing aspects of being involved in Affiliate Marketing. At AffClicks we recognize that different Affiliates will spent varying amounts of time on their businesses and occasionally life will take over and mean extended periods on auto pilot. This week we have released our first tool towards this goal, weekly email account summaries. 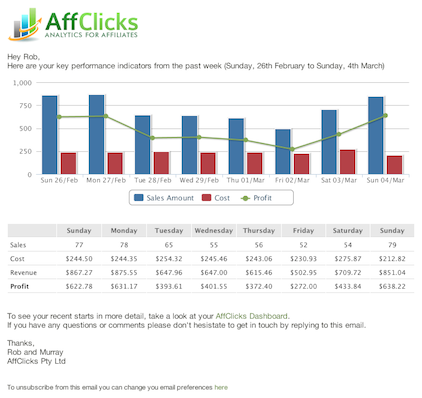 These summaries, mailed out on a Monday morning, list a users transactions, revenue, cost and profit for each day over the past week as well as provide a graph of the information that matches the ones you can see within AffClicks. It also includes quick links that auto login so a user can quickly view more information from within the App. It should be noted that there is also a link to allow users to quickly opt out of these emails if they no longer wish to receive them. A look at the weekly mailout AffClicks users now receive. This is our first step of many in helping the busy Affiliate. In future we will introduce more customisations for mailouts and make account recommendations for Affiliates that don’t have time to deeply analyze all the analytics that are being generated around their Affiliate business.